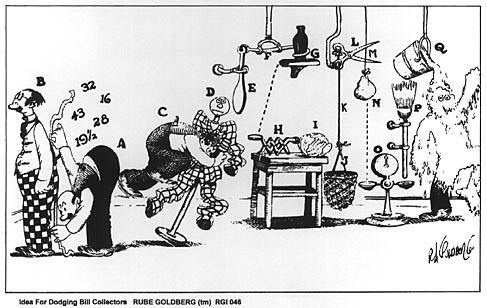 spurgeonblog: Happy Birthday Rube Goldberg! As Tailor (A) fits customer (B) and calls out measurements, college boy (C) mistakes them for football signals and makes a flying tackle at clothing dummy (D). Dummy bumps head against paddle (E) causing it to pull hook (F) and throw bottle (G) on end of folding hat rack (H) which spreads and pushes head of cabbage (I) into net (J). Weight of cabbage pulls cord (K) causing shears (L) to cut string (M). Bag of sand (N) drops on scale (O) and pushes broom (P) against pail of whitewash (Q) which upsets all over you causing you to look like a marble statue and making it impossible for you to be recognized by bill collectors. Rube Goldberg's machines have inspired countless homages...in the kid's game Mousetrap, in film characters from Wallace and Gromit to Wile E. Coyote to Pee-Wee Herman, in kinetic sculpture races, in the art machines at Burning Man and at Survival Research Labs shows, in Make Magazine, in this amazing TV commercial for Honda. Take a minute to check out The Official Rube Goldberg Web Site and the Rube Goldberg's entry in wikipedia. man this guy was amazing! his ideas for normal day things just blow me away in astanashimint! sometimes i think hes crazy but man! this guy was tottaly cool!